Are you planning on having a Halloween party this year? 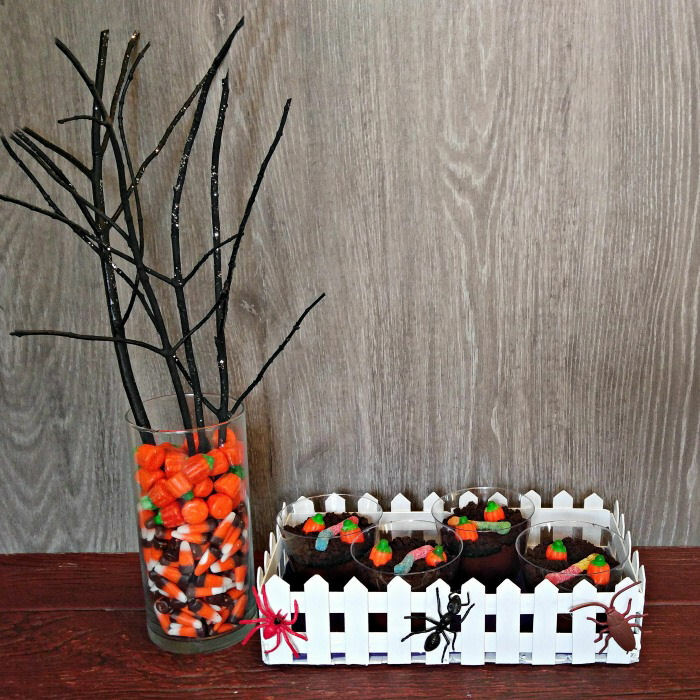 This graveyard picket fence is the perfect way to display your favorite Halloween sweet treats. It would make a great table centerpiece. Nothing sets the mood for a Halloween party better than a table centerpiece with a spooky look. And if you also have lots of themed Halloween food, so much the better. 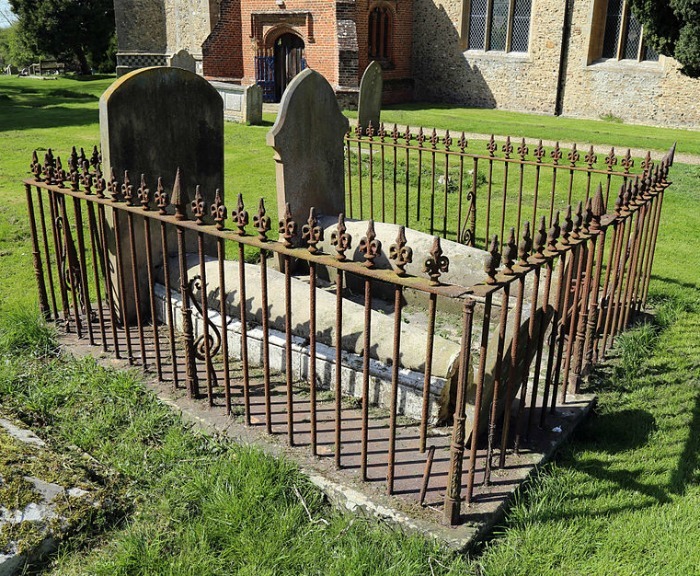 This graveyard picket fence is meant to resemble a fence that sometimes surrounds tombstones in a graveyard – complete with creepy crawlies. I made mine in a few hours and it can be used to decorate in a lot of different ways. 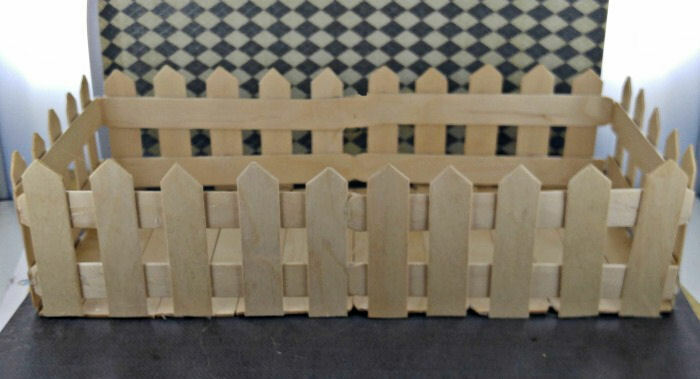 Since I am not a metal worker and this is supposed to be a fun and EASY craft, I am making my fence with craft sticks. To get started, I trimmed the edges of 32 craft sticks to make them flat edged, and used sharp scissors to make a point on each end of 15 more. 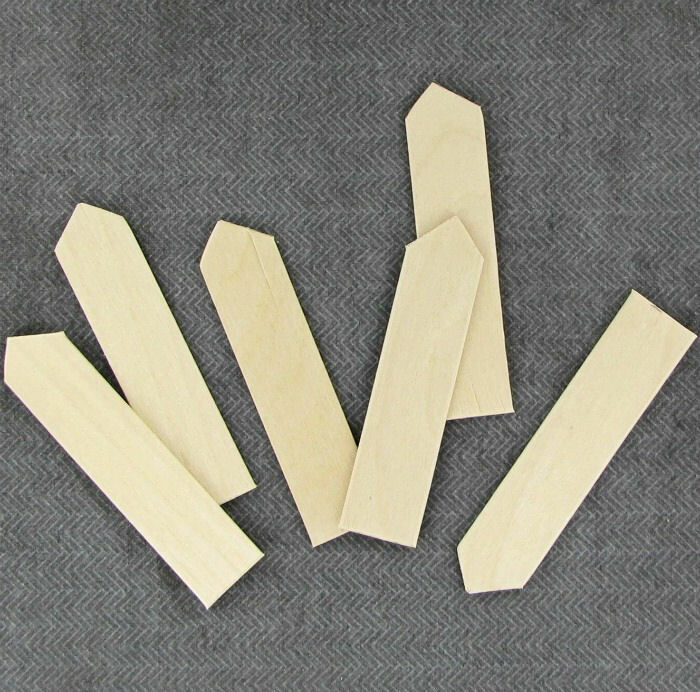 My sticks were 15cm long and I cut the ones that had the points in half to make my pickets. This project was a trial and error thing for me, and I ended up wasting a lot of craft sticks. I ended up throwing my first draft away and started again, making the base first. It gives something for the pickets to attach to and helps to keep the whole thing square as you work. 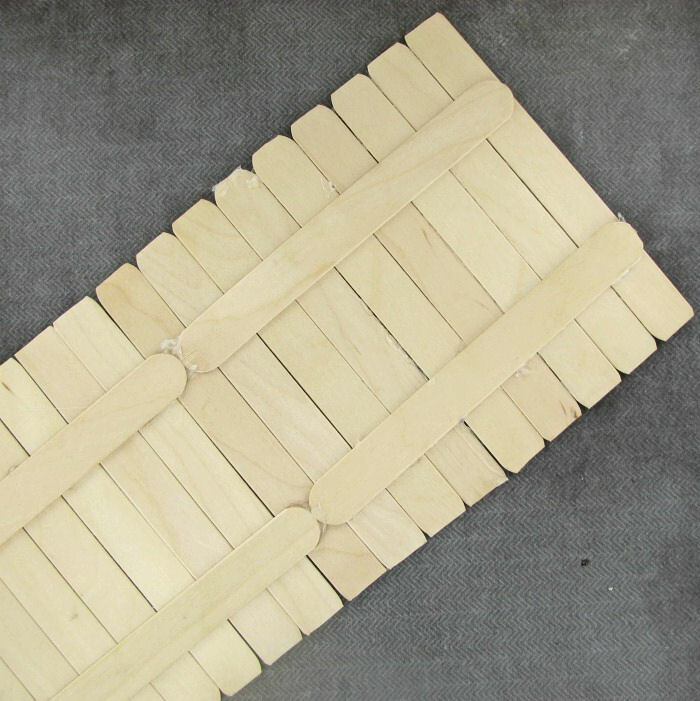 Lay the craft sticks down side by side (as evenly as you can) and hot glue four sticks to the bottom of the base. This holds the sticks in place quickly. 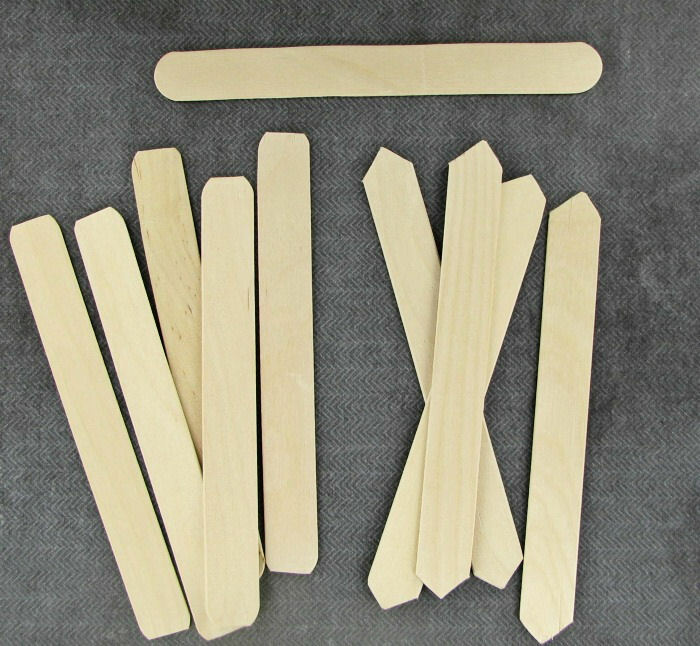 To make the pickets lay two craft sticks on the table and add hot glue to the back of the pickets about 1/3 up and down from the edges and push it in place. I found it easiest to do the edges first, then the middle picket and end with the other two. Each picket section.uses five pickets. TIP: as you hot glue, be sure to test to make sure the base of them is level with the table. This will ensure they will sit well when you attach them to the base. 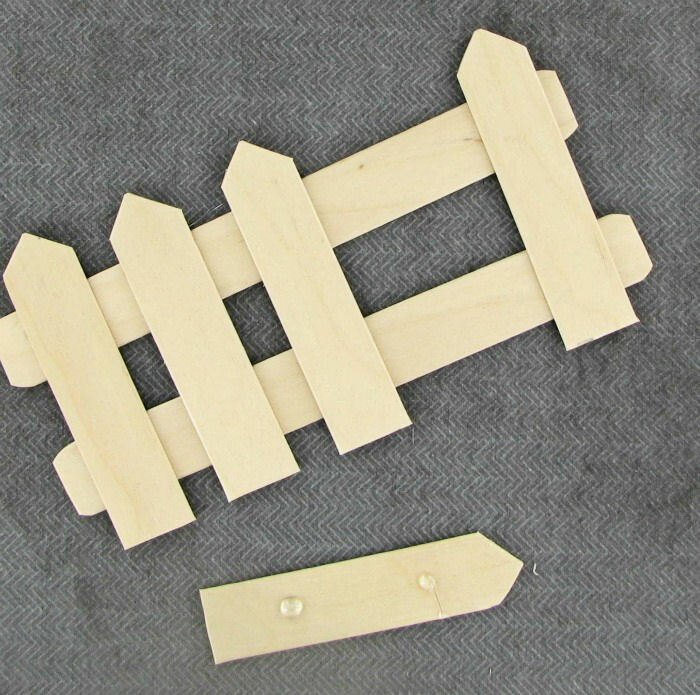 Once you have the six picket sections finished, just add some hot glue on the bottom edge of each picket on the inside and press against the edges of the base. You will have two picket sections on each long side and one on each short side. After you attach the sections to the base, add a couple of drops of glue where the sections meet to tack them together. 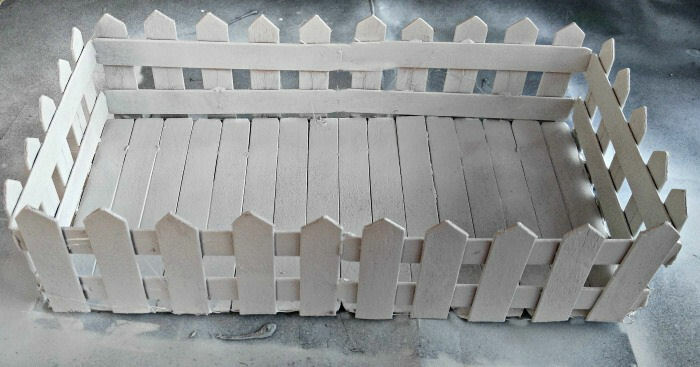 Place the finished graveyard picket fence on some large cardboard and spray the whole thing white with spray paint and allow it to dry. 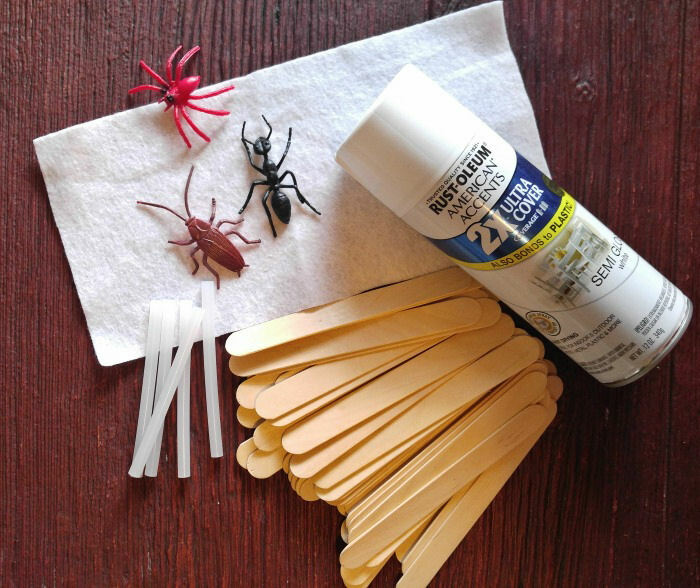 When the paint has dried, use hot glue to attach three plastic creepy crawlies in place, climbing up the fence to get to the goodies. 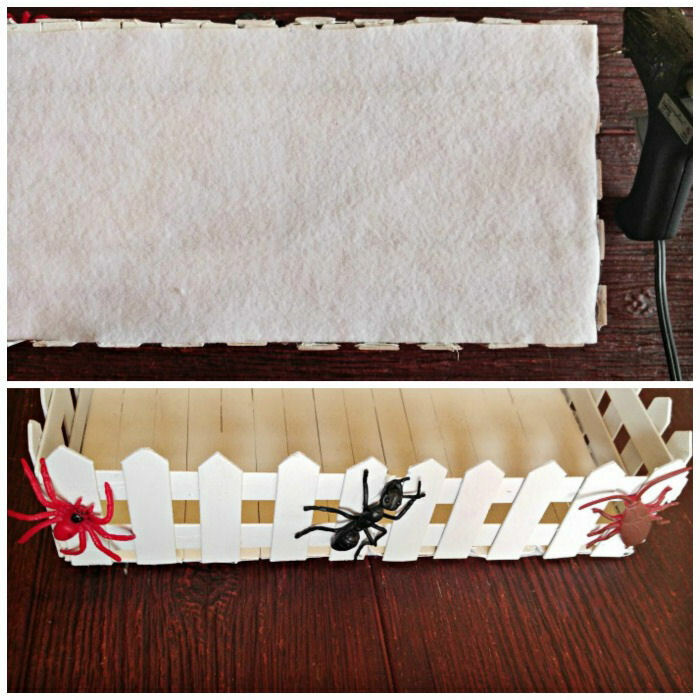 Finish the project by cutting a piece of white felt the size of your base and hot gluing it in place to protect your furniture. Dollar store spiders are fun to use in any craft. Check out how I used them to make spider ice cubes, here. Time to display your goodies. 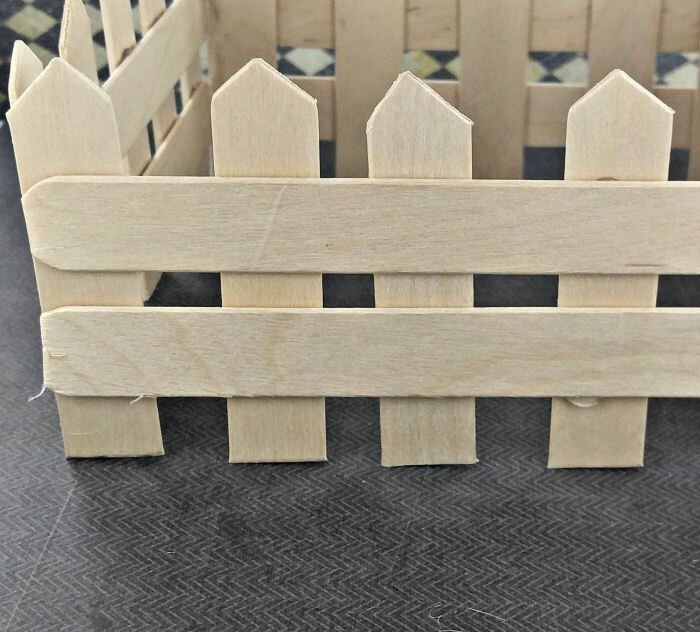 This fun Halloween picket fence makes a great table centerpiece. Use it along side of a candy corn centerpiece for extra effect. 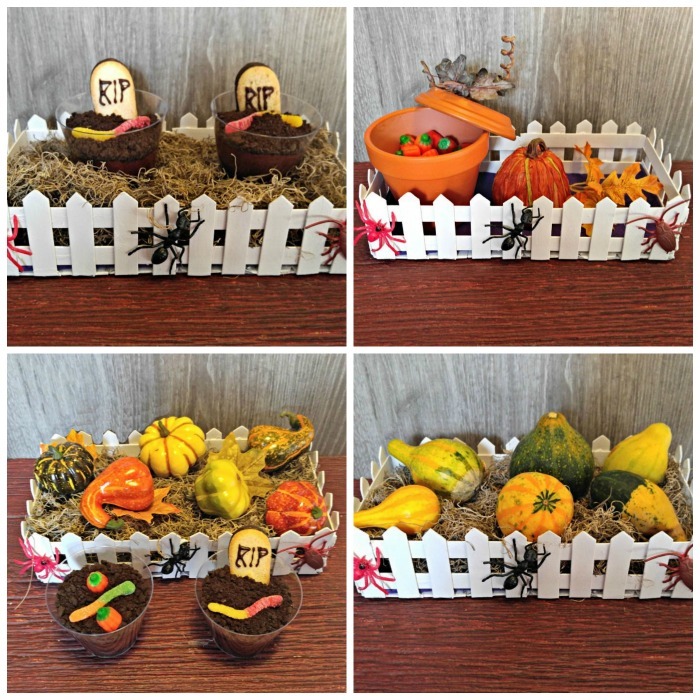 Use it to showcase my Halloween dirt cups and they looked great in it.